JO STARTED to make the cuddly concept for friends and it soon expanded to a Facebook page and a Twitter account. Personalised with your own photographs front and back, the handmade Huggable Heroes make a comforting keepsake. “The response has been amazing. Children love their daddy cuddles,” explained Jo. “Our Huggable Heroes helped my children enormously. My daughter, Charlotte, takes hers everywhere so daddy doesn’t miss a thing. 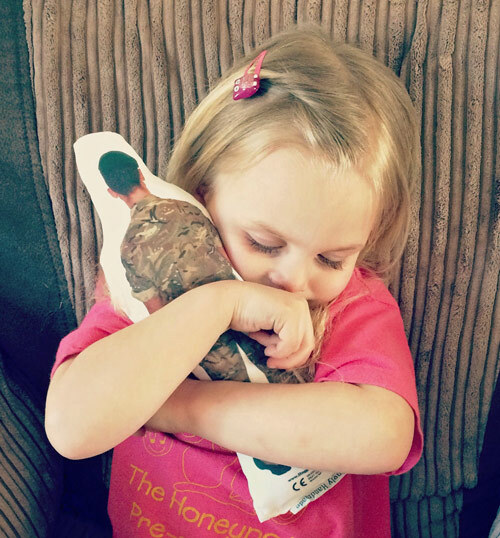 Jo realised how much Huggable Heroes could help children with a parent or loved one working away and decided to offer them to any family – not just those in the military. Huggable Heroes have also caught the eye of a producer of a successful play at the Edinburgh Fringe which featured Army deployment through the eyes of a ten-year-old girl. The play has been adapted into a film, A Father’s Promise, and a Huggable Hero has been written into the script. Jo is proud of what has been achieved so far. “Huggable Heroes help to reinforce family bonds and reduce separation anxiety in our brave children,” she explained. “We’ve even made them for the serving mummy or daddy to take with them when they go away.